What Is The Best Horse Trailer Camera On The Market? Driving with a trailer is hard work. There are no two ways about it! Whether you are out and about in your car plus a trailer, or you are driving a 50ft transporter, having a bit of extra help when you are backing up or parking can be a real godsend. 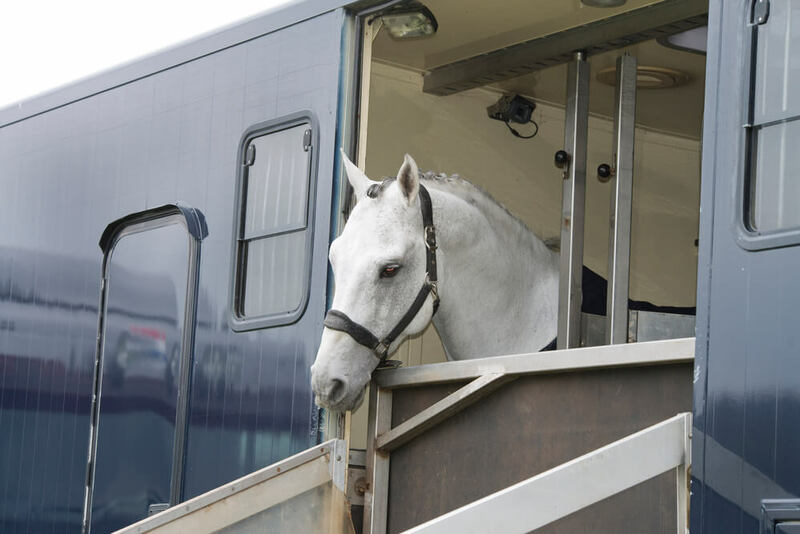 Keeping an eye on your precious cargo is also very useful, as you can check what your horse is up to and decide if he’s happily munching on his haynet or if he needs you to pull over an intervene. You might well be struggling to find the best horse trailer camera due to the vast amount of choice and technical specification information – but never fear. This wireless camera is fantastically versatile and ideal for keeping an eye on things behind you. It’s completely wireless, so it’s infinitely transportable. No need for WiFi – This clever little device creates its own mobile hotspot, meaning that even in areas with very little signal where your usual tricks don’t work you can still get your trailer camera to connect to some internet and work fine. Other operations work while using the camera – Unlike many systems, using this camera will not prevent you receiving calls or texts. This makes it very convenient, especially if you get lost and need to call for directions! Comes with accessories – This camera comes with a holder so you can view it hands free, and an adaptor and charger for connecting. Full warranty and tech support – In the unlikely event that you had issues with your new camera, you would be able to access support to help you through it, and a full warranty so it could be replaced in the event of manufacturer fault. Connection can drop out – Some users have reported that it is tricky to keep the camera in enough signal to keep it working. This is a great option for longer trailers so you can see behind you for parking or obstructions. The fact that this device creates its own mobile hotspot is also a massive plus, especially if you are taking your trailer to no-signal areas. This handy little camera can be run from the cigarette lighter on your dashboard, making it highly portable and great to take out and about. Wireless system for hands free operation – Having a camera that needs no extra wiring or very complicated installation is a must in this day and age of easy, simple technology. 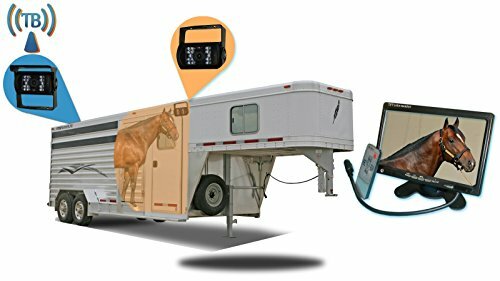 Four-channel for additional cameras – You can hook up additional cameras to this device, and keep an eye on different parts of your trailer; say one for parking, one for checking on your horse and a spare for good measure? Good after-sales support – Having a good amount of support once you have purchased a technical device is great, as it means that you can get answers to any questions you might have, and access help if anything is a bit beyond your level of expertise. IP69 rating for weather protection – These devices are tested under 3 metres of water depth for 2 hours before they leave the factory, meaning that they will survive a rain shower or two on the way to your destination! Works best in daylight – If you are driving at night the performance might not be all that great and you will need additional lighting to see the screen. This is an idiot-proof system, suitable for all types of application including parking, keeping an eye on your blind spots and having additional cameras to see what’s going on inside your trailer. A slimline camera that is designed with the horse trailer in mind, this one is waterproof with inbuilt night vision. It is super easy to install and can run entirely off the cigarette lighter. Wireless backup camera that works up to 50ft distance – Having a camera that can see behind you a long way is a great asset to your trailer driving – especially if you have a particularly long trailer. Weatherproof and shock resistant – As we all know, the weather is not reliable and can throw surprises at us. This camera is weather resistant, so even in the worst of the storms it will still report back to you. Night vision option – If you are driving a trailer at night you will need to have a camera that can cope with the change in light conditions, and this one will. LCD monitor is very light and thin – This means that it will take up very little space on your dash, and is very easily transportable. It’s a pricey option – This trailer camera has a bigger price tag than some of the competitors, which is something to bear in mind if you have a budget. This being said, it’s a quality piece of kit that should last you for years to come! If you are looking for a great, easy to install camera that gives you a good view of the rear of your trailer, then this one is a great option. A good horse trailer camera is a must-have when you are transporting your horse. Yes, good horse bits, halter, water, food, are all important, however, the best horse trailer camera will help you park, allow you to check for any hazards behind you as you’re driving, and give you a peep into your trailer so you can see what your horse is up to. If you are looking for a great horse trailer camera so you can see what is going on behind you, have a look at these three options. 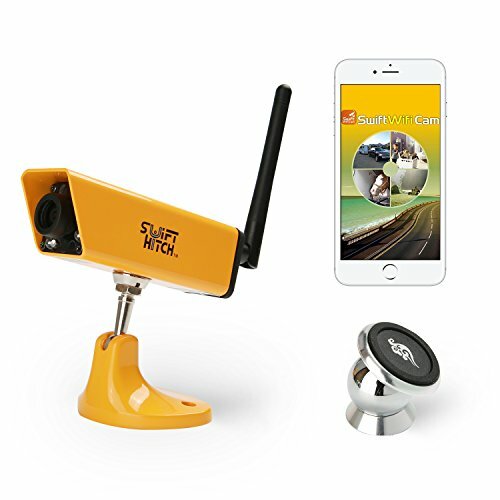 For a good wireless camera that creates its own connection then the Swifthitch SH04 Wireless Battery Camera System for Trailer Hitch Up is for you. If you want a multi-camera system that can accept three other cameras so you can keep an eye on different areas, go for the RV Rearview Via WiFi Link and Monitoring on Android or iPhone Digital Wireless Backup Camera Kit. 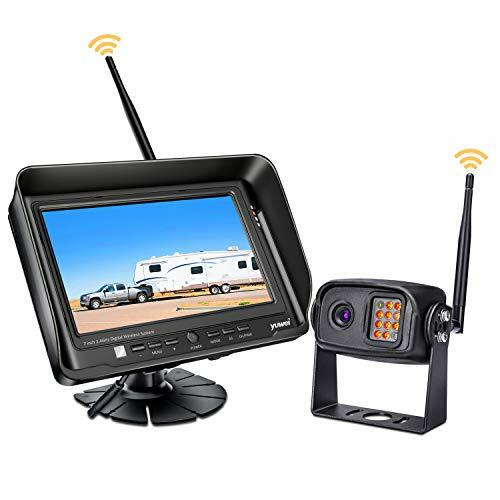 The Tadibrothers 9 Inch Horse Trailer Monitor with 2 Wireless Mounted RV Backup Cameras is what you’re after if you are able to splash out on a quality camera that is weatherproof and highly effective. I agree that being able to see what is going on in the trailer is a must these days. Especially if you are planning a long trip and the horse is starting to get antsy in the back during that time. It might make sense to pull over and calm them before they get hurt.